Prefiltration: When water first enters the R.O. 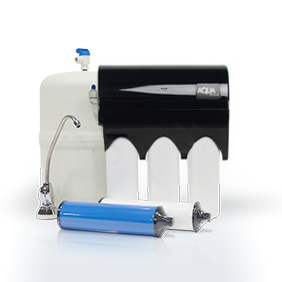 System, it flows through a prefilter that protects the automatic shut-off and the membrane from clogging with debris. The job of the prefilter is to filter out larger particles such as silt, rust or scale, extending the life of your R.O. membrane and allowing it to tackle the smaller contaminants. In a higher output T.F.C unit, the prefilter also has activated carbon in it. Not only does the porous activated carbon remove chlorine particles, (which is necessary to protect the refined T.F.C. membrane), it serves to filter out other contaminants as well. The Membrane: Water then travels to the operational center of the system - the membrane. Here, most particles too small to be trapped by the prefilter are removed from the water stream and rinsed to the drain. The membrane's microscopic pores allow Hydrogen and Oxygen molecules through, (and water is H2O). The majority of the dissolved solids and other contaminants are flushed into the drain's water stream and exit the system. The "Final Polish": After the membrane, the R.O. water is routed to the holding tank. The automatic shut-off tells the system when it's time to make more water. When you turn on the faucet and draw water from the holding tank, it then goes through its final stage of filtration, a carbon filter, to remove any remaining tastes and odors before reaching your glass. This adds a "Final Polish" to your water.